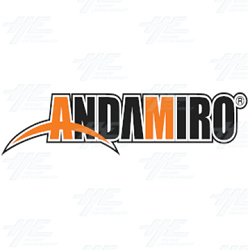 Andamiro is having a huge clearance specials sale on a range of their brand new machines, including Eiffel Tower, Hungry Chicken, Pump Jump for kids, Penalty Shot, Winners' Cube DX, and Winners' Cube Classic. Eiffel Tower is a ticket redemption arcade machine that uses a French themed cabinet styled after the iconic Parisian landmark and the playfield resembles the Eiffel Tower, and is a mechanical ball shooter game. Read more. Hungry Chicken is a child-friendly ticket redemption 1 or 2 player game and is easy to play for players of all ages. The cabinet features simple controls, fun chicken themed artwork, and bright LED lighting. Read more. Pump Jump is dance arcade machine and is part of the popular Pump It Up series. This version is aimed specifically at young children and includes a child friendly interface, fun music and a new cabinet designed especially for kids. Read more. Penalty Shot is a ticket redemption sports game. This computerized indoor kicking game machine will bring an energetic aura and compelling excitement in every location. Read more. Winners' Cube comes in a Classic and Deluxe model. It is a prize redemption game in which players must test their skills against the machine in order to win the prizes on offer. Improve your game to increase your chances of winning amazing prizes! Read more about the Deluxe model and the Classic model. The popular games from the famous Korean factory are all new and ready to go into your location. Standard accessories included with each machine include keys, tools and cables, and a manual. This is perfect for operators looking to replace old machines with new ones, or locations looking to expand their redemption sections, or operators interested in setting up a location or Family Entertainment Center. Don't miss out on this opportunity - it's available for a limited time only! If you are interested in any of the above machines or have any questions, please email our friendly sales staff at or call our office on (02) 4968 9313.